TRENZ Homes was established in 2005, and is a leading brand in kitset homes in New Zealand. Like Pacific Property Solutions the company appreciates that when building your dream house in the islands there will be challenges and understand how kitset homes can overcome many of the problems. The TRENZ team has a special connection with Fiji, her people and way of life. This connection inspired them to expand their business into the Pacific region and is now working with PPS to bring their stylish homes here with a special collection of South Pacific house plans. TRENZ kitset homes arrive with everything you and your builder need to construct a home that is strong and caters specifically for you. Each design is available with either steel or timber framing at its center so you have the option to build with whichever framing choice is favourable to you. The beauty of these kitset homes is the flexibility of design and straightforward systems that make the build option easy for all project types. Once you’ve chosen your design you can mix and match materials to suit your style and budget. Whether it is exterior cladding or internal wall linings, a custom kitchen or luxury bathroom, you have control over what goes into your kitset home. We understand that one size doesn’t fit all, and everyone has their own idea of what is beautiful and what is functional in a home or holiday hideaway. 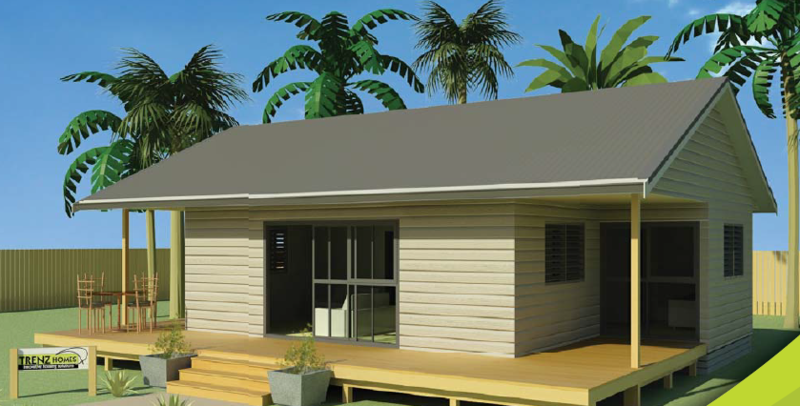 TRENZ offers a full range of options from a nifty 2 - bedroom beach bure to an 8-bedroom oasis so you’ll be sure to find something to suit your taste and budget. This extensive range of functional homes has many options from deck space to room layoutSmall enough for 2, big enough for all the family and more with 2, 3 and 4 bedroom layouts and up to 2 en suite bathrooms. Choose from 4 different exterior looks with covered verandahs to the front or side to shelter you from the winds and maximise the sunshine. This range of simple and functional entry-level beach houses offers 2, 3 and 4 bedroom options. These clever designs will push the boundaries and your imagination with their clever interlinking decks and modular appeal. Starting with a funky 2 bedroom bure designed for sleeping on one side and entertaining on the other. Moving on to a stylish 2 house complex with bedroom and living on one side and double bedroom accommodation on the other joined by a large deck. Full of Fijian flare and perfect for families and guests. Finally a cluster of 4 double bedroom bures connected by decking that leads to the main living and entertainment center with covered verandahs. Fantastic for large families, time – share or even small resort. Containers make great homes and TRENZ turn containers into small homes and much needed school classrooms? Ventilation space behind the wall linings will keep you cool even on the hottest days. With a choice of 1 or 2 bedroom units, these container homes come with bathroom facilities, small kitchen and space for a small deck out front. What more could you want? A great idea for a kid’s sleep out, office, spare room for unexpected guests or maybe a caretaker’s cottage. We’ll even kit them out with built in furniture and a timber deck. Before choosing your TRENZ kit home contact PPS to discuss which framing system to use and which design best suits your personality and needs.